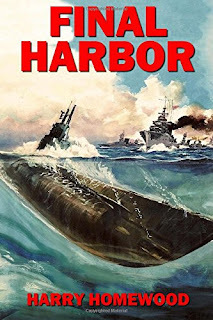 I never really thought that a novel following the action of a WW2 submarine crew would be interesting and exciting enough to keep my attention, but FINAL HARBOR proved me wrong. Not only is this book very well-written, the level of technical and historical detail is, in a word, staggering. In fact, if there are any complaints to be had about this book, it is that the little technical details occasionally get in the way because, while it may be proper protocol to repeat every command given, it doesn't need to really be written out that way! But that is really about the only complaint I have regarding this book, and that complaint is relatively minor. The plot does occasionally stray into the domestic lives of the crew, but I think taken as a whole that isn't a bad thing, as it does tie us more strongly to the characters, and when there are casualties among the crew, the effect it has on the reader is a lot more pronounced. these aren't just cardboard cutout submariners firing torpedoes at the enemy and gritting their teeth while being depth charged, these are human beings with families and friendships, goals and aspirations. As for the action itself, the scenes are extremely well written. Submarine warfare is very much winner-take-all, because even a single torpedo hit is capable of blowing a ship in half, while even one depth charge, if well-placed, is enough to shatter a submarine's hull and send her entire crew to the bottom of the ocean. Harry Homewood is able to deliver these scenes with nail-biting tension, and you come out on the other side with a sigh of relief, or a gasp of horror. Like war itself, this book does not pull its punches! In conclusion, if you have any interest in WW2 submarine warfare, especially in the Pacific theater, I highly recommend this novel, and you can find it here on Amazon. There is a sequel, SILENT SEA, which I have read, and found equally engaging. Check them out!